“No one knows what they have until it’s gone” is a line of dialogue that pops up toward the end of “Museo,” an off-kilter, character-driven dramatization of the 1985 heist of priceless artifacts from Mexico’s National Museum of Anthropology. With a little retooling, the sentiment might apply to the movie’s hapless antihero, Juan Nuñez. He doesn’t understand what he’s lost until he has it — and can’t get rid of it. 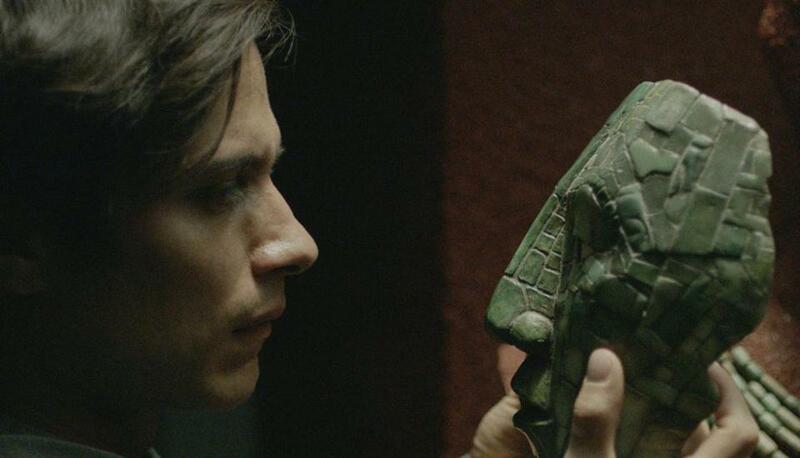 That Nuñez is played by the deceptively elfin Gael García Bernal (“Y Tu Mama Tambien,” “Mozart in the Jungle”) is one of the chief attractions of “Museo,” alongside the scattergun stylizations of director/co-writer Alonso Ruizpalacios. The heist took place on Christmas Day in Mexico City; the guards were less than vigilant, and the alarm system hadn’t worked in three years. Nearly 140 Mayan, Aztec, Zapotec, and Miztec pieces, many of them tiny figurines and works of jade and gold jewelry, were stolen from the museum’s Mayan room. The entire country was outraged at this theft of its cultural birthright. The theories were that a daring cat burglar had pulled it off, or a crack team hired by an art-loving billionaire. The reality was almost comically different: Two inept layabouts, student veterinarians in their 30s still living with their parents, robbed the museum for reasons of vague cultural rebellion but mostly because they were bored. Bernal’s Juan (the names have been changed) is the ringleader, which only means he’s the most dedicated screw-up. In an early scene, we see him spoiling Christmas for his young nieces and nephews because, as he puts it, “Santa is a tool for indoctrinating kids into capitalism.” (He’s not wrong.) Mostly Juan likes to sit around getting high and mad at the world, and he’s as shocked as anyone when the heist comes off without a hitch. Ruizpalacios films the sequence with a satisfying absence of dialogue — a nod, perhaps, to the classic robbery scene in “Rififi” (1955) — after which the plot slowly unwinds into good-looking entropy. Juan and his slower and more sensitive best friend/accomplice Wilson (Leonardo Ortizgris) steal Juan’s father’s car and head to Acapulco for a hoped-for meeting with a fence, who leads them to a bluff British antiquities dealer (a delightful Simon Russell Beale, of “The Death of Stalin”), who reads them the riot act. Things devolve from there. “Museo” is slightly frustrating on first watch, as its themes lie partly hidden behind Bernal’s intentionally abrasive performance and the mix-and-match filmmaking of Ruizpalacios: Bursts of faux-epic movie music in Tomas Barreiro’s score, camerawork that can be ironically portentous, scenes that flit along the edge of the surreal. The connective tissue is sometimes hard to discern. It’s there, though, and one of the keys is the jade death mask of the Mayan king Pacal, the largest of the stolen artifacts and the one Juan keeps returning to like a man searching for his own face. To whom does the art belong? Juan was taught by his intellectual doctor father (Alfredo Castro) that the National Museum stole the pieces from the peoples who made them, and they do seem to wend their bumpy way back toward something like home, past a heritage-site docent (Bernardo Velasco) and a legendary stripper (Leticia Brédice) at a country roadhouse to fishermen and their families on a beach at dawn. If there’s a message to “Museo” — one you might pick up on well before the movie’s protagonist — it’s that you can’t easily steal something that already belongs to an entire country. Directed by Alonso Ruizpalacios. Written by Ruizpalacios and Manuel Alcalá. Starring Gael García Bernal, Leonardo Ortizgris, Simon Russell Beale. At Museum of Fine Arts, various dates, Jan. 11-30; and Brattle, Jan. 17. 128 minutes. Unrated (some language). In Spanish, with subtitles.